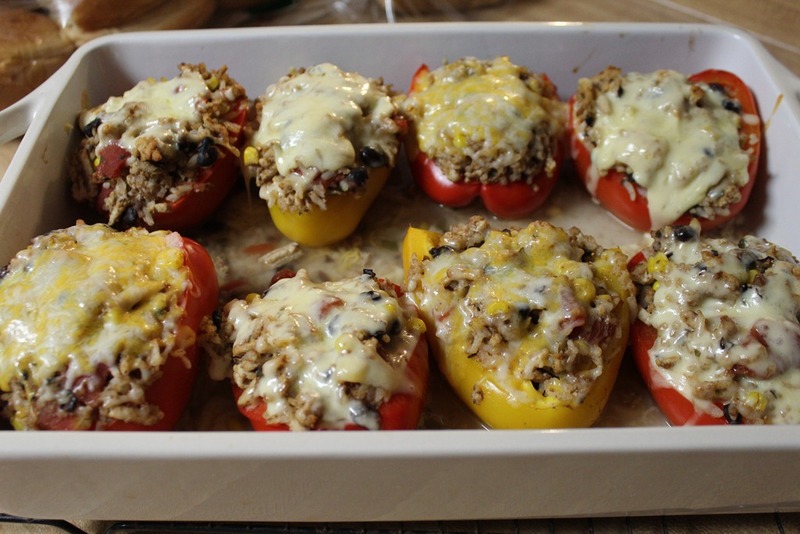 I normally call these “stuffed peppers” when I’m making them, but I figured they needed a better name if I was going to post the recipe. So, I let my son come up with the name, and he came up with the “fiesta” part. 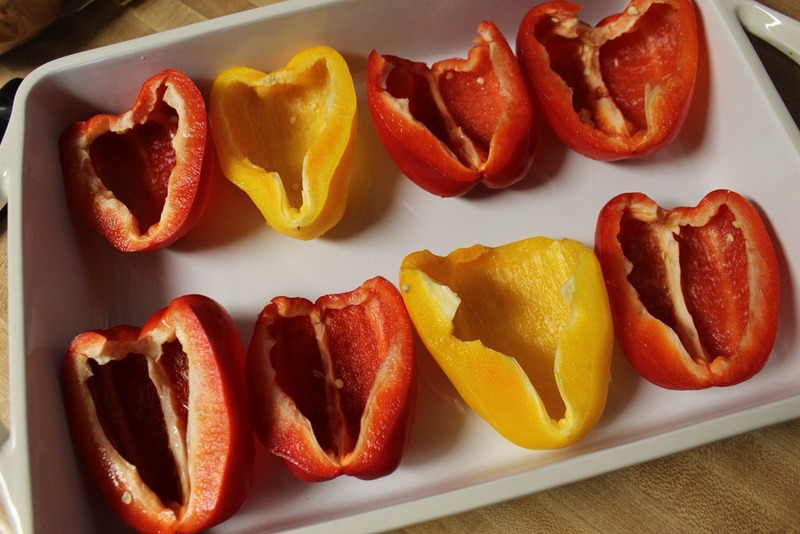 These peppers are protein packed and full of healthy nutrients, and I know you will love them! This is a wonderful and healthy meal to make for your family, and it will make everyone happy too! 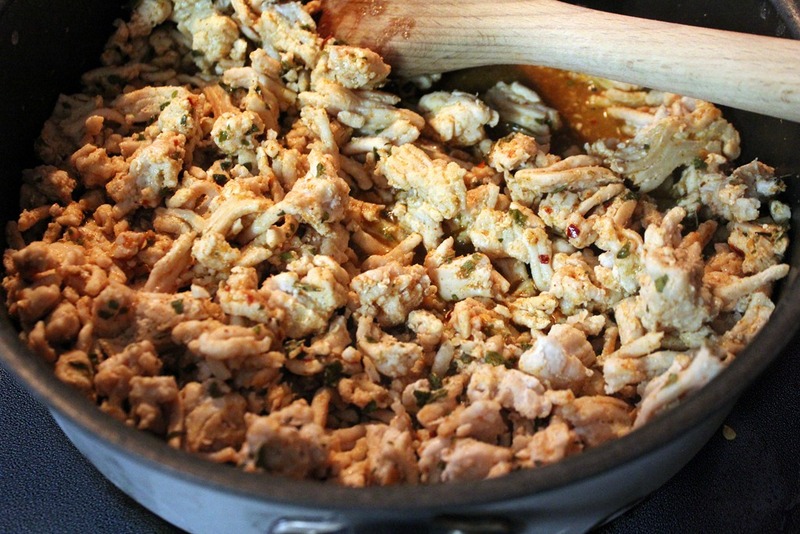 You will use ground turkey breasts instead of other ground meats. Please make sure you get the “ground breast.” Don’t get just ground turkey. If you don’t get the breast you are just getting meat that is just as fatty as regular ground beef. On a side note, sometimes I have a bit of “stuffing” left over from stuffing the peppers. I will use it to make lettuce wraps for a healthy packed lunch. Cook the ground turkey breast over medium heat until thoroughly cooked. Preheat oven to 350 degrees. While the meat is cooking, halve and clean the peppers for stuffing. Once the meat is done cooking combine the taco/fajita seasoning with 2/3 c water. Add the seasoning and water mixture to the cooked meat. Reduce heat and let simmer until there really isn’t any liquid left in the pan. 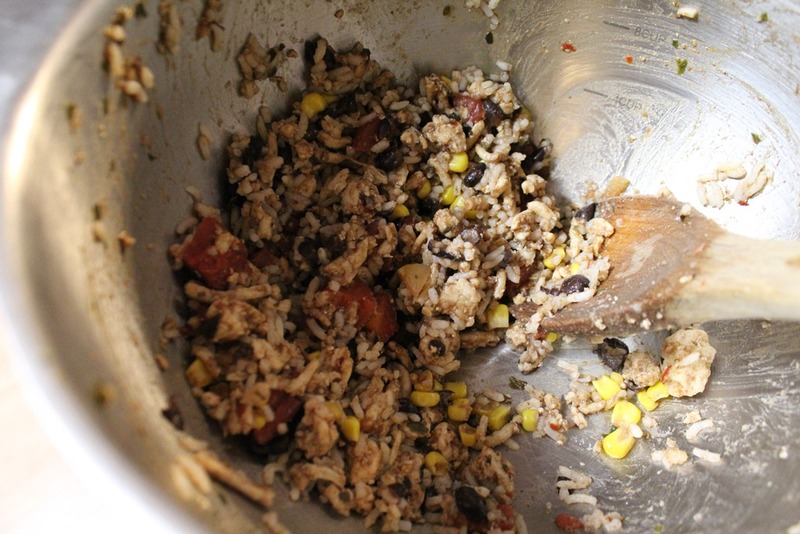 In a large bowl add the cooked turkey, corn, beans, rice, and salsa. Gently mix to combine. Stuff the peppers with the mixture. Add 1 cup of water to the baking dish. This will help to soften the pepper and keep them from sticking to the baking dish. Cover with aluminum foil, and bake for 45-50 minutes. About 10 minutes before the peppers are done, remove them from the oven, add the cheese to the tops and place back in the oven uncovered until the cheese melts. I like to garnish my peppers with scallions and fat free sour cream. Enjoy!! Preheat oven to 350 degrees. While the meat is cooking, halve and clean the peppers for stuffing. Once the meat is done cooking combine the taco/fajita seasoning with 2/3 c water. Add the seasoning and water mixture to the cooked meat. Reduce heat and let simmer until there really isn’t any liquid left in the pan. In a large bowl add the cooked turkey, corn, beans, rice, and salsa. Gently mix to combine. 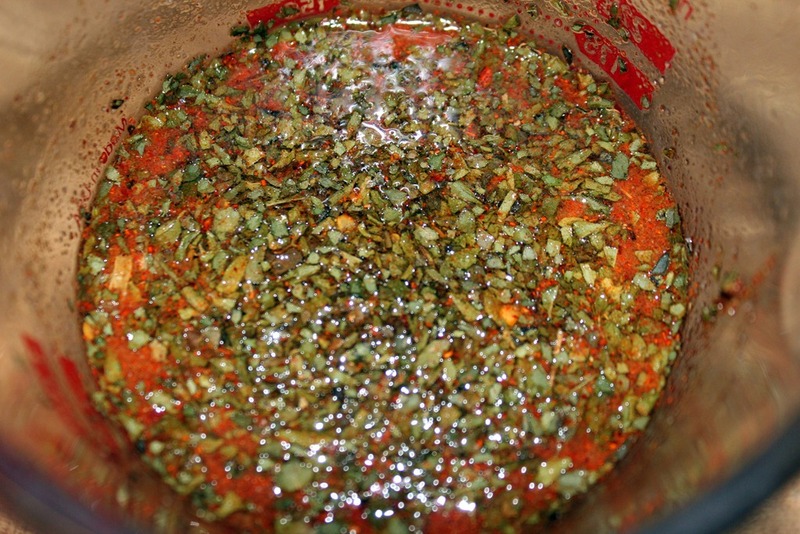 Stuff the peppers with the mixture. Add 1 cup of water to the baking dish. This will help to soften the pepper and keep them from sticking to the baking dish. Cover with aluminum foil, and bake for 45-50 minutes. About 10 minutes before the peppers are done, remove them from the oven, add the cheese to the tops and place back in the oven uncovered. I like to garnish my peppers with scallions and fat free sour cream. Enjoy!! 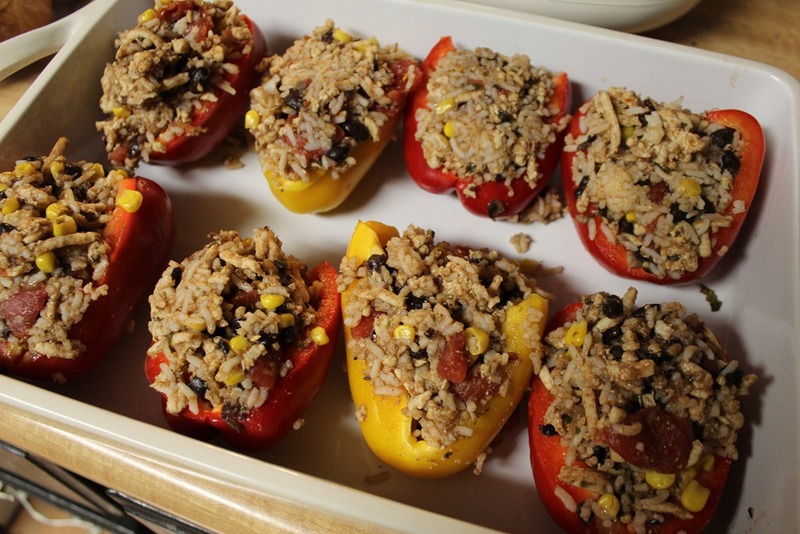 This entry was posted in Dinner, Recipes and tagged healthy, stuffed peppers, stuffed red peppers, turkey breast on October 31, 2012 by fromfltond. 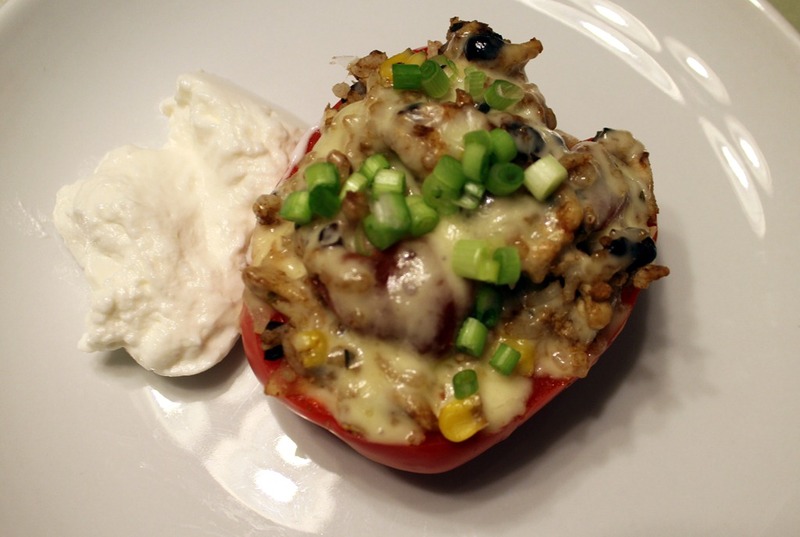 Love stuffed peppers. Love Mexican flavored dishes. These look wonderful! Thank you! I swear they taste even better the next day too. I made these last night and my husband and I loved them! We left the cheese off to save a few calories and we also used light sour cream ( we don’t think the fat free sour cream is very good), and I also add a touch or Tobasco Sauce to had a little kick! YUMMY!!! We will make these again, soon!!! Thanks for the post! Good idea with the hot sauce! I’m so glad you enjoyed them!